Oakview Juvenile Residential Center (OJRC) is one of the Ohio Department of Youth Services' twelve community corrections facilities. The program began in 1994 as a ten bed group home and was expanded in 2005 to encompass a new state-of-the-art 24 bed facility. Youth may only be placed in Oakview by a juvenile court upon being adjudicated as a felony offender. Watch a short video to learn more about Oakview's facility, programs and goals. The Oakview Juvenile Residential Center is a 24-bed residential facility, which houses adjudicated male felony offenders between ages 12-17. Academic Content standards are taught as they relate to the Ohio Graduation Test, as well as the Ohio 7th and 8th grade Achievement Tests. Academic Content standards are taught as they relate to the Ohio Graduation Test, as well as the Ohio 7th and 8th grade Achievement Tests. The subject areas taught include: OGT Math, OGT Science, OGT Language Arts, and OGT Social Studies. Health and Physical Education are also included in the curriculum. 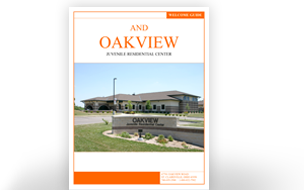 For more information on Oakview, please download or request our information packet.